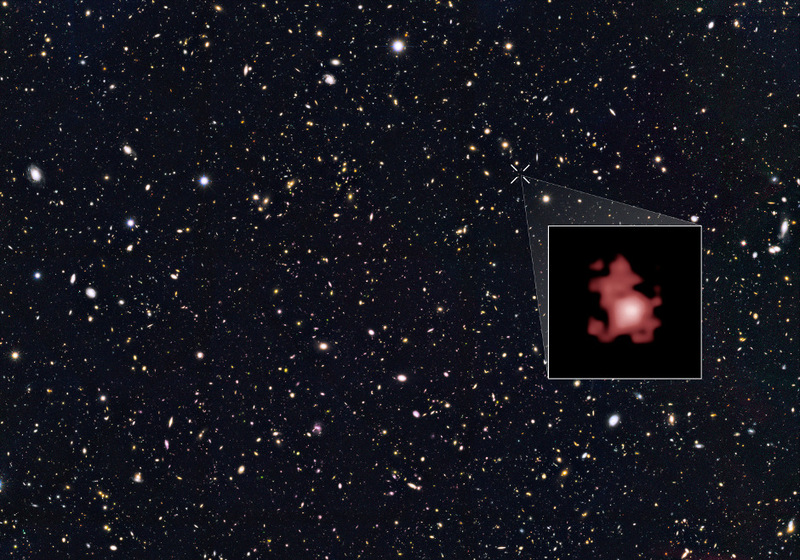 This image shows the position of the most distant galaxy discovered so far within a deep sky Hubble Space Telescope survey called GOODS North (Great Observatories Origins Deep Survey North). The survey field contains tens of thousands of galaxies stretching far back into time. The remote galaxy GN-z11, shown in the inset, existed only 400 million years after the Big Bang, when the universe was only 3 percent of its current age. GN-z11 is actually ablaze with bright, young, blue stars but these look red in this image because its light was stretched to longer, redder, wavelengths by the expansion of the universe. Click the image for a full-size version. Image credit: NASA, ESA, and P. Oesch (Yale University). By pushing the NASA/ESA Hubble Space Telescope to its limits astronomers have shattered the cosmic distance record by measuring the distance to the most remote galaxy ever seen in the universe. This galaxy existed just 400 million years after the Big Bang and provides new insights into the first generation of galaxies. This is the first time that the distance of an object so far away has been measured from its spectrum, which makes the measurement extremely reliable. The results will be published in the Astrophysical Journal. Using the NASA/ESA Hubble Space Telescope an international team of astronomers has measured the distance to this new galaxy, named GN-z11. Although extremely faint, the galaxy is unusually bright considering its distance from Earth. The distance measurement of GN-z11 provides additional strong evidence that other unusually bright galaxies found in earlier Hubble images are really at extraordinary distances, showing that we are closing in on the first galaxies that formed in the universe. 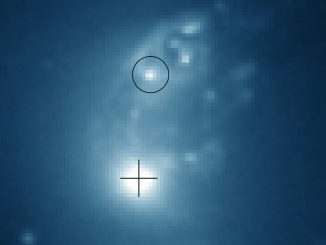 Previously, astronomers had estimated GN-z11’s distance by analysing its colour in images taken with both Hubble and the NASA Spitzer Space Telescope. Now, for the first time for a galaxy at such an extreme distance, the team has used Hubble’s Wide Field Camera 3 (WFC3) to precisely measure the distance to GN-z11 spectroscopically by splitting the light into its component colours. 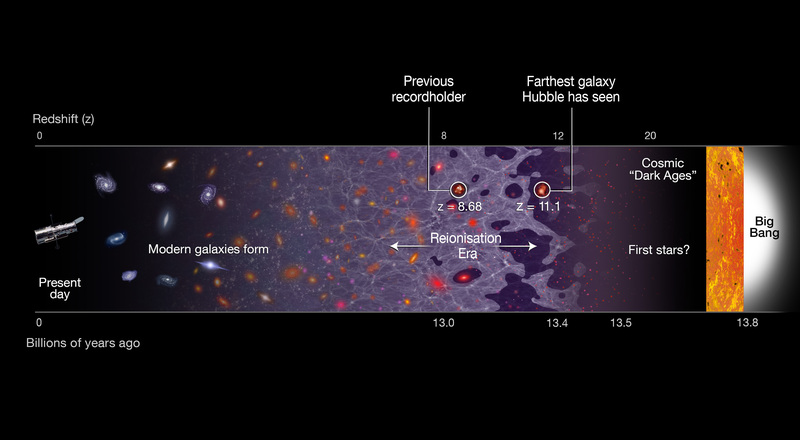 “Our spectroscopic observations reveal the galaxy to be even further away than we had originally thought, right at the distance limit of what Hubble can observe,” explains Gabriel Brammer of the Space Telescope Science Institute and second author of the study. This puts GN-z11 at a distance that was once thought only to be reachable with the upcoming NASA/ESA/CSA James Webb Space Telescope (JWST). “We’ve taken a major step back in time, beyond what we’d ever expected to be able to do with Hubble. We managed to look back in time to measure the distance to a galaxy when the universe was only three percent of its current age,” says Pascal Oesch of Yale University and lead author of the paper. To determine large distances, like the one to GN-z11, astronomers measure the redshift of the observed object. This phenomenon is a result of the expansion of the universe; every distant object in the universe appears to be receding from us and as a result its light is stretched to longer, redder wavelengths. Before astronomers determined the distance to GN-z11, the most distant measured galaxy, EGSY8p7, had a redshift of 8.68. Now, the team has confirmed GN-z11’s distance to be at a redshift of 11.1, which corresponds to 400 million years after the Big Bang. This illustration shows a timeline of the universe, stretching from the present day (left) back to the Big Bang, 13.8 billion years ago (right). The newly discovered galaxy GN-z11 is the most distant galaxy discovered so far, at a redshift of 11.1, which corresponds to 400 million years after the Big Bang. The previous record holder’s position is also identified. Its remote position puts GN-z11 at the beginning of the reionisation era. In this period starlight from the first galaxies started to heat and lift the fog of cold hydrogen gas filling the universe. The previous record-holding galaxy was seen in the middle of this epoch, about 150 million years later. Click the graphic for a full-size version. Image credit: NASA, ESA, and A. Feild (STScI). The combination of observations taken by Hubble and Spitzer revealed that the infant galaxy is 25 times smaller than the Milky Way and has just one percent of our galaxy’s mass in stars. However, the number of stars in the newborn GN-z11 is growing fast: The galaxy is forming stars at a rate about 20 times greater than the Milky Way does today. This high star formation rate makes the remote galaxy bright enough for Hubble to see and to perform detailed observations. These findings provide a tantalising preview of the observations that the James Webb Space Telescope will perform. “This new discovery shows that JWST will surely find many such young galaxies reaching back to when the first galaxies were forming,” concludes Illingworth. In 1936, infant star FU Orionis began gobbling material from its surrounding disc of gas and dust with a sudden voraciousness, eating the equivalent of 18 Jupiters in the last 80 years. 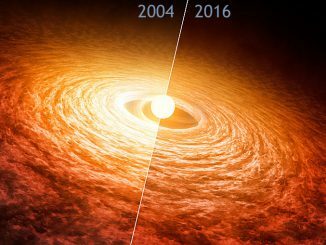 During a three-month binge, as matter turned into energy, the star became 100 times brighter, heating the disc around it to temperatures of up to 6,650 °C. 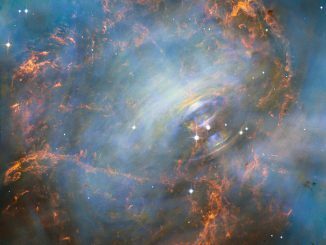 This new NASA/ESA Hubble Space Telescope image reveals the beating heart of one of the most visually appealing, and most studied, supernova remnants known — the Crab Nebula in the constellation Taurus. At the centre of this nebula the spinning core of a deceased star breathes life into the gas that surrounds it.